Have you ever experienced a sick feeling in the pit of your stomach after doing something wrong? The oppressive burden is sometimes so strong that it has physical repercussions. Like a weighty ball and chain shackled to your ankle, it chafes and makes it difficult to move forward in life. No one felt this feeling more strongly than King David. It was the time when nations would go to war. David, a mighty warrior, always led his troops into battle, but this year was different. The king decided to stay home. While his men were living in tents and sleeping on the ground under the command of Joab, the army captain, he was dwelling in his luxurious palace attended by all his servants. His laziness and lack of concern for his men lead him to make some bad decisions. While taking a walk on the roof of his palace, he happened to look down and see a beautiful woman taking a bath. He inquired after her and, though being told she was already married, had her brought to him. Soon after David got the disturbing news that Bathsheba was pregnant with his child. Instead of taking responsibility for his sin, the king tried to cover it up. He sent a message to Joab asking him to send Uriah, her husband, home from the battle. David hoped that if he came home to his wife everyone would think nothing was wrong and that the baby was Uriah’s. Unfortunately for David’s scheme, Uriah refused to go home. Though David urged him, he would not enjoy any comforts while his fellow soldiers were enduring hardship. 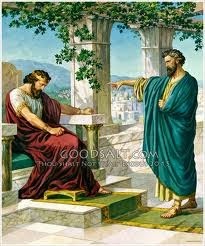 David became desperate and finally sent Uriah back with a sealed letter to Joab. The letter contained instructions to put Uriah at the front lines. Joab obeyed the king’s orders and Uriah died in battle. When the king received the news of Uriah’s death he gave a sigh of relief. He believed now that he was safe from discovery of his sin, but that was not the case. God knew what had happened and sent Nathan, the prophet, to confront David. When David realized what he had done – adultery and murder – he was horrified. The weight of his actions made him physically sick. He begged the Lord to forgive him. “Have mercy on me, O God, according to your unfailing love; according to your great compassion blot out my transgressions. Wash away all my iniquity and cleanse me from my sin.” Though there was a steep price to pay for his transgressions, David heard the words of forgiveness that he longed to hear. “The Lord has taken away your sin. You are not going to die,” the prophet spoke. King David suffered much because of his sin, but his heart was freed knowing he had been forgiven. There will be times in our lives when we will make mistakes – big and small. We must be on our guard constantly seeking to make good decisions. But if the day ever comes that you blow it, remember that God is waiting to forgive when you come to Him in true repentance. There will always be consequences for sin – but even in the aftermath of our mistakes God will give the grace we need to endure them. I trust and pray that you will always make wise decisions – but never forget – there is nothing greater than God’s grace!